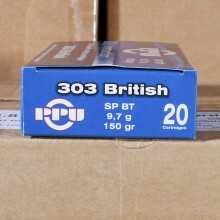 BULK 303 BRITISH AMMO SHIPS FREE AT AMMOMAN! .303 British ammunition is a rifle and machine gun caliber that Great Britain placed into service in 1888. 303 British served as the standard cartridge of the British military for more than 60-years, until its replacement by the 7.62 NATO round. Today, shooters primarily use .303 Brit rounds for hunting deer and other game like black bear and even moose. You might know 303 British as 7.7x56mmR, both terms refer to the same .303-inch rifle caliber. 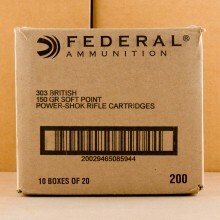 Modern 303 British rounds evolved from a black powder propelled original cartridge that was used with the European Lee-Metford rifle. You’re likely to find today’s rounds loaded with as light as 150 grain bullets or as heavy as 180 grain bullets. Traditionally, most rounds are loaded with soft point (SP) but you will also find the heaver rounds loaded with hollow point boat tail (HPBT) bullets. 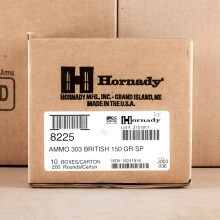 In terms of the 303 British round’s ballistic properties, expect muzzle velocities of about 2,800 feet per second with the lighter rounds and somewhere around 2,500 feet per second from the heavier bullets. Overall, you will enjoy muzzle energy of around 2,500 foot pounds from the 303 Brit caliber. 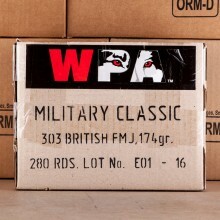 While military surplus 303 British is usually in-stock, you will also likely see some newly manufactured 303 British ammo for sale here at AmmoMan.com as ell. 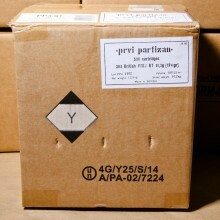 Prvi Partizan, Winchester, and Remington are just a few of the major commercial manufacturers that still produce the rifle ammunition. When looking at surplus ammunition, there is usually a premium placed on the Mark 7 cartridge design. This round is largely believed to be the best combination of accuracy and stopping power. (The “Mark” system is basically a way to know what generation of ammunition you are buying. There are eight different generations of 303 British Ammunition, from Mark I to Mark VIII. 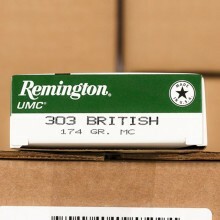 While a fun round for range shooters, 303 British is also a serviceable hunting round where the cartridge is capable of taking down large game. An excellent selection for whitetail deer hunters and black bear hunters, Canadians have also been known to fire 303 British to take down Moose. In fact, Canadian Rangers still use the round to protect themselves from polar bears.